The 11s: With greater years come greater responsibilities. As young adolescents, the 11s are ready to take on new levels of academic and personal responsibility. Some changes in their school life include homework on the weekends, choosing electives, developing time-management skills and delving deeper into the world of abstract thinking. This is a year of writing and research unlike any before. For nearly 100 years, C&C 11s have printed and bound a book of their collective poetry and prints. The topics covered by the 11s’ social studies and language arts programs are an extension of those covered in the 10s. We move forward from last year’s study of the Middle Ages to examine the geographical, political, economic, and social developments that occurred during the Renaissance. We gear up for the Renaissance in a place far from Europe: China. In researching daily life from selected periods along the imperial continuum, the 11s gain insight into the political, economic and social organization of a culture very different from those they have studied thus far. Additionally, the 11s learn about China’s impressive contributions in the area of technology—inventions that were of paramount importance to the emergence of the Renaissance. We transition from China to Europe by way of a study of Marco Polo. Following Marco home along the Silk Road, we take up residence in Venice. As the hub of international trade during both the Middle Ages and the beginning of the Renaissance, Venice serves as an excellent link from one time period to another. And as one of the most vibrant of the Italian city-states, it provides the ideal locale in which to learn about daily life. Having studied Venice at its height, the 11s then follow its decline as a maritime power, shifting their attention to the Atlantic, where they learn about the emergent nation-states of Europe and their race to Asia. The 11s contrast an increasingly outward-looking Europe with a newly closed China, a marked shift from the continents’ respective positions during the medieval period. Geography plays a major role in our studies throughout the year, as we join the people of the Renaissance in their growing knowledge of the workings, places, and peoples of the globe. The printing press is perhaps the most exciting aspect of the 11s’ curriculum. The 11s are in charge of operating two Chandler Price Treadle Presses, which were made in the 1800s. The 11s print all of the standard stationery used at the school: Library Cards, Attendance Cards, Afterschool Slips, Late Passes, and Trip Slips. In addition to producing these items, students are responsible for the business end of printing, including serving the customers, setting prices, and balancing the budget. The job requires that the students learn to operate the presses safely and efficiently. Students work on two large group projects: the holiday card sale and the Literary Magazine. Their work is packaged and sold to the students and parents of the City and Country community. The profits are used to replenish the printing supplies. 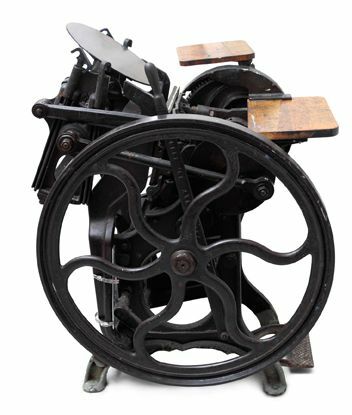 The history of printing, from China’s innovations to that of Johannes Gutenberg, is included as an integral part of our study. Students learn that the leap from transcription by hand to printed copies facilitated the dissemination of ideas throughout the world. Research continues to be a major component of the curriculum. The 11s engage in independent and group research, both formal and informal, throughout the year. The 11s’ formal research paper will be on a topic related to China. Skills such as finding resources (both in books and on the internet), note-taking, outlining, drafting, editing, writing bibliographies, and using primary and secondary sources will be taught. Trips are an essential part of our curriculum. Whether students visit Chinatown, view Chinese paintings at the Metropolitan Museum of Art, examine navigational maps at the New York Public Library, attend a Renaissance music concert, or watch a play by Shakespeare, they come away with rich examples of the arts and sciences they are studying. The language arts curriculum aims to develop students’ appreciation for literature and facility with language. Through a variety of texts, the 11s begin to talk formally about components of literature: theme, character, setting, etc. Books we read as a class may include some of the following: The Examination, Daughter of Venice, The Thief Lord, Adventures and Discoveries of Marco Polo, Spice and the Devil’s Cave, At the Sign of the Golden Compass. The 11s continue to pursue their individual interests, reading daily in the Library and at home as part of their homework. The 11s study vocabulary formally for the first time, which will include discussions about etymology and the history of the English language. The contributions of Shakespeare will be a part of this study. The 11s continue to develop their writing skills, both creative and expository. They study and write poetry, make up stories in their journal, learn how to write a formal research paper, and begin to grapple with the concept of “thesis” in a persuasive essay. A weekly study of selected grammar topics will aid them in these pursuits. The 11s study geometry, fractions/decimals/percent, exponents and square roots, graphing, and pre-algebra. The 11s have Math three times a week an hour each day. On Tuesday, the Group has a 30-minute Math Lab session in which the students will be divided into two groups. Each child assesses his or her understanding of the material and chooses whether to stay in the classroom and continue to strengthen their understanding or work on math extensions of the same concepts. The teacher may assist the students in their selections according to his assessment. The children base their decisions on their accuracy on homework and in-class assignments, level of participation during group discussions, absences, and input from the teacher. Dividing the Group one day a week allows for more one-on-one support for those who need it and more challenge for those ready to apply their skills in multiple ways. Additionally, learning to understand their needs and advocate for themselves as learners is a wonderful step for 11s in developing independence. The students are allotted computer time in their schedules. They use this time when they are engaged in social studies-related projects that would benefit from the use of the computer. During these times, they may receive formal instruction in word processing, Adobe Illustrator, Photoshop, Internet research, and Media Blender. The entire Group plays in Yard for one-half hour Monday through Friday. The students choose activities by democratic votes led by the weekly Yard Leader. Once a week, the 11s participate in Skills Yard, an instruction period that is meant to help students hone their Yard skills. The 11s receive homework every night. Many assignments given are due in two or three days, or even in one week. Students must learn to budget their time accordingly and not wait until the night before several assignments are due to start their work. Generally, nightly homework should take students an hour and a half.